Because of the care and expert machining needed to manufacture aerospace components, Sylhan is AS-9100D registered, which supports our Quality Assurance Program with a company-wide emphasis on Operator Responsibility for product quality. Sylhan works to military specifications as required and complies with ANSI and ASME standards for our specialty metal aerospace components. The Sylhan Quality Assurance Program was initiated as a result of our customers’ sophisticated and continually demanding aerospace industry requirements and we use the latest technology such as 2-OGP Smartscope Flash CMM, Tesa Micro-Hite 3D CMM and Niton XL-800 Alloy Analyzer to assure the highest customer satisfaction. Sylhan manufactures zero-defect aerospace components in our over 22,000 square-foot plant. 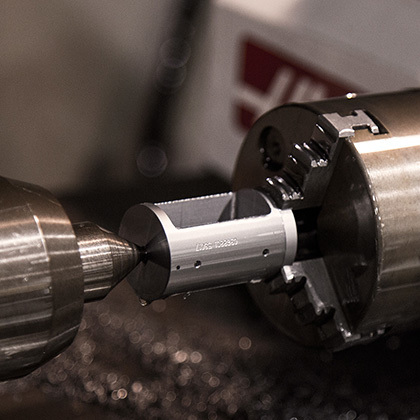 Our expert team uses five-axis milling, a CNC turning center and screw machines for both high and low volume production. Sylhan partners with our customers by assisting your internal team with research and development projects, and manufacturing of prototypes by a variety of methods like digitizing drawings when there is no model or creating new 3D models. Our focus on continuous improvement to our processes results in reduced costs for our clients, and as a skilled small business, we adapt and pivot quickly and efficiently. Being reliable under pressure means that not only do we deliver on time every time, but we are also focused on providing enhanced value for our customers every day. Every component is carefully crafted to your exact specifications, and with our experienced vendor managed inventory capabilities, we have the ability to have your products on-hand and can ship them out at a moment’s notice. The emphasis we place on client satisfaction and quality assurance has resulted in a wide portfolio of products and programs within the aerospace industry. Products include guide vanes, counterweights, balance weights for blades, vibration dampeners, winglets, transducer bodies, manifolds, nozzles, penetrators, fasteners, heat shields and a listing of components for commercial air vehicles. Sylhan maintains strong partnerships with our aerospace customers who are some of the world’s largest and most demanding. We have worked on production and prototype parts for the F35, Blackhawk, Naval Hawk, CH53K Heavy Lift, Chinook, S-76 and H92 helicopters, among others.